Not sure what they have in store, but I'm looking forward to that day. What really intrigues me is how Scruffy Dragon and IMT will be involved. SGM does have a relationship with Scruffy, so that is not as big of a surprise. But knowing that IMT has been doing something with them now is truly from left field. - Is there a reason why Super Solider, Amazon, Hyena, and Dr. Doomsday are shown in their promo picture? - Sic-1 made it known he was doing a lot with Hyena. But recently he's been taking on other WIPs (Grandmaster Ryu, IMT's Two-Face) Does this mean Hyena is completed and just waiting for this date? - It was said both Iron Lantern and Thanoseid were going to get upgrades, will these be released then? Whatever it is, I can't wait, and I hope you are anticipating it as much as I am. 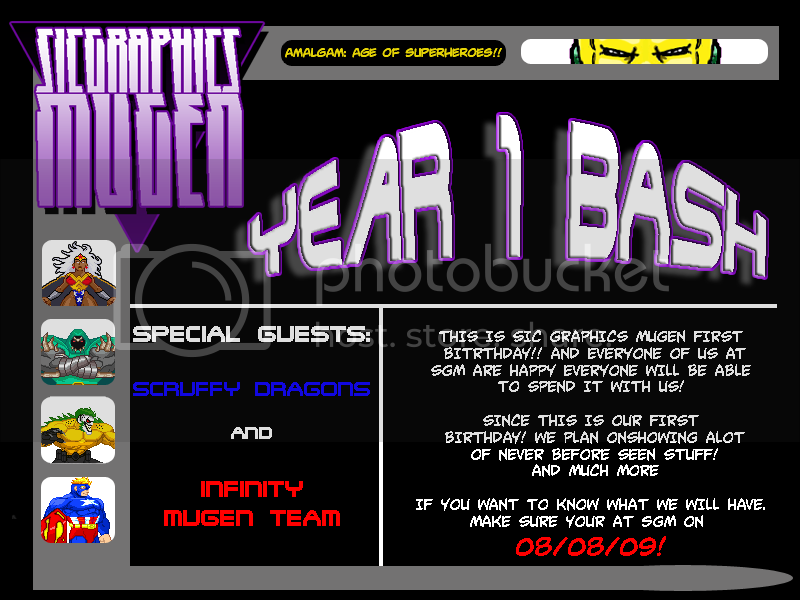 So make sure you go to: Sic Graphics Mugen - Amalgam Project today! And definitely make sure you are there 8/8/09! I know of a few things SGM's doing, but even for us ScruffyDragons there are bound to be some cool surprises. The thing about IMT is certainly a part of that.